The U.S. Department of Housing and Urban Development (HUD) is rewarding our nation’s “good neighbors”. Through its Good Neighbor Next Door (GNND) initiative, HUD now sells homes for 50% off list price with today’s current mortgage rates. If you’re a “Good Neighbor”, you can buy any eligible HUD home at half-off its listing price, with just $100 downpayment. Click to get a program mortgage rate and pre-approval (Apr 23rd, 2019). The U.S. Department of Housing and Urban Development recently launched a series of Neighbor Next Door initiatives. Neighbor Next Door is a collection of FHA home sales programs meant to promote homeownership and to build stronger communities. The FHA itself is not a mortgage lender. It’s a mortgage insurer and a sub-agency within HUD. The FHA’s role is to protect the nation’s lenders against losses and default. It currently insures more than $1 trillion in U.S. home loans. The FHA was formed in 1934 to promote homeownership and neighborhood stability. It continues this mission today. As compared to mortgages via Fannie Mae and Freddie Mac, the FHA will insure loans which look “less good” on paper. To the FHA, a borrower’s complete credit profile is more important than any isolated derogatory event. This is among the reasons why the FHA’s Back to Work program exists. Via Back to Work, home buyers who experienced a short sale or foreclosure can be approved for a new home loan after just 12 months, assuming an otherwise strong payment history. No federal agency offers a similar program. The FHA insures loans of up to $625,500. Click here for today's live FHA mortgage rates (Apr 23rd, 2019). As a sub-agency of the Department of Housing and Urban Development, FHA also promotes homeownership through its Good Neighbor Next Door (GNND) initiative, a series of programs meant to revitalize eligible communities. Homes sold through the Good Neighbor Next Door program are sold at 50% discounts, a benefit subsidized by HUD. The GNND program is limited to specific properties in specific neighborhoods, and not all home buyers will be eligible. Here is the FHA Good Neighbor Next Door mortgage guidelines, in question-and-answer format. Get pre-approved as a Good Neighbor (Apr 23rd, 2019) by requesting a mortgage rate. What properties are eligible for the Good Neighbor Next Door program? Any single-family home located within a HUD designated revitalization area can be eligible for the Good Neighbor Next Door program. Revitalization areas are designated by household income, homeownership rate, and the level of area foreclosures. Properties for sale must be HUD-owned. Is every property sold at a 50% discount, or just some of them? All Good Neighbor Next Door homes are sold at 50% off, no matter what. Eligible homes are sold to eligible buyers with the discount. What is the minimum downpayment for a Good Neighbor Next Door home? The Good Neighbor Next Door program requires a minimum downpayment of $100, if you use FHA financing. For all other mortgage types, standard downpayment requirements apply. This means that a VA loan is available with 100% financing. Conventional loans are available with as little as 5% down. What buyers are eligible to participate in the Good Neighbor Next Door program? The Good Neighbor Next Door program is available to certain public-sector employees including law enforcement officers, teachers, firefighters, and emergency medical technicians. Are all law enforcement personnel eligible for Good Neighbor Next Door? Most law enforcement officers are eligible for the program. To qualify as a “Good Neighbor”, law enforcement personnel must be full-time employees of a federal, state or local government; or an Indian tribal government. Are all teachers eligible for Good Neighbor Next Door? Many teachers are eligible for the program. To be considered a “Good Neighbor”, HUD requires teachers to be employed as a full-time teacher by a state-accredited public or private school that serves student from grades pre-kindergarten through 12. In addition, the school at which a teacher is employed must serve students from the area in which the HUD-offered home is located. Are all firefighters eligible for Good Neighbor Next Door? 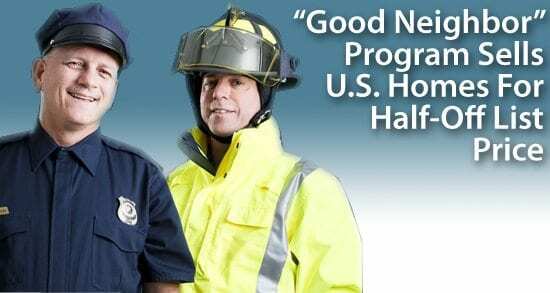 Most firefighters are eligible for Good Neighbor Next Door. In order to use the program, firefighters must be employed full-time by a fire department unit of a federal, state or local government, or an Indian tribal government, which serves the area in which the home is located. Are all emergency medical technicians eligible for Good Neighbor Next Door? Most emergency medical technicians are eligible for Good Neighbor Next Door. In order to use the program, emergency medical technicians must be employed full-time by an emergency medical services responder unit of a federal, state or local government, or an Indian tribal government, which serves the area in which the home is located. Do I need to use FHA financing with the Good Neighbor Next Door program? No, buyers of homes through the Good Neighbor Next Door program are not required to use FHA financing, even though the program is HUD-sponsored. Buyers may use FHA loans, VA loans, USDA loan, or conventional loans. They may also seek financing via a bank, or may pay cash for eligible homes. Get mortgage rates for today's eligible homes (Apr 23rd, 2019). Do I have to buy the home as a primary residence? Yes. The Good Neighbor Next Door program requires that you live in the home you purchase. How long must the property be my primary residence? The Good Neighbor Next Door program requires that buyers occupy their home as a primary residences for a minimum of 36 months. After 36 months, a buyer can sell the home, retain the home as a second home, or rent the home as an investment property without restriction. Can I buy the home as an investment property? No. The Good Neighbor Next Door program cannot be used for investment properties or rental homes. Program participants must agree to live in the home being purchased. How many days do I have to “move in” after my closing date? After closing on a home via the Good Neighbor Next Door program, you can move in within 30 days, 90 days, or 180 days depending on HUD’s opinion of the home and its condition. If the home is mostly move-in ready, you will be able to move in within 30 days. If the home requires substantial repairs, you will be granted up to 180 days. What if I move within 3 years of buying a HUD home through the program? Buyers who move, sell, or otherwise end occupancy prior to 36 months are required to repay HUD, on a prorated basis, the amount of the home’s original discount. The proration decreases by 1/36 for each month in the home. For example, if you sell your home after 24 months, you must repay 12/36, or one-third, of your original HUD 50% discount. HUD may also limit your participation in future homeownership programs. When I sell the home after 3 years, do I get to keep 100% of the profit? Yes, if the home is your primary residence for 36 months or more, when you sell, you are entitled to all of the proceeds from sale and all accumulated home equity. There is no repayment to HUD required whatsoever. Do I have to use a real estate agent to buy the home? Yes, the Good Neighbor Next Door program requires home buyers to use a real estate agent to assist with the purchase. You may also work with a real estate broker. Do I have to be a first-time home buyer to use Good Neighbor Next Door? No, you don’t have to be a first-time home buyer to use the Good Neighbor Next Door program. However, you may not own a home at the time you submit your offer to buy a HUD-eligible home. Also, you may not have been a homeowner within the prior twelve months. For example, if you are buying a home with the Good Neighbor Next Door program today, you may not have been a homeowner at any time since . Can I buy a 2-unit, 3-unit or 4-unit home via the Good Neighbor Next Door program? No, multi-unit homes are not available for purchase via the Good Neighbor Next Door program. Only one-unit homes are eligible. This includes single-family residences, condominiums, town homes and row homes. How much earnest money is required with the program? The Good Neighbor Next Door program requires every home buyer to make an earnest money deposit equal to 1% of the home’s list price. This means one percent of the price before HUD’s 50% discount. There are two caveats. First, your earnest money deposit must be at least $500 and must not be more than $2,000. Second, if you are awarded the home and fail to make an effort to close on it, your earnest money may be forfeited in full. If I leave or lose my job during my first 36 months in the home, what are my obligations? If you leave or lose your job while within the first 36 months in your home, you remain obligated to maintain the home as your primary residence. If you choose to move, sell or rent your home, you will be asked to repay HUD, on a pro-rated basis, the amount of your original property discount. For example, if your residency ends after 12 months, HUD will collect 24/36 of your original listing discount, or two-thirds. For U.S. home buyers in search of a good bargain, HUD-eligible homes are selling at half-off their listing price. You can get a complete list of Good Neighbor-eligible homes in your area via your real estate agent, or just start with your Good Neighbor Next Door pre-approval here. Get today’s mortgage rates and confirm your program eligibility. Then, start looking for homes. At 50% off and with just $100 down, buying and owning a new home can be more affordable than you ever thought possible. Get started with today's rates and Good Neighbor pre-approval (Apr 23rd, 2019).